Meg Rosoff is the author of numerous novels for adults, young adults, and children, including How I Live Now and Jonathan Unleashed, and the coauthor of Beck. She is the winner of the 2016 Astrid Lindgren Memorial Award, the Guardian Children's Fiction Prize, the Michael L. Printz Award, and the Carnegie Medal. Meg Rosoff lives in London. Grace Easton is a freelance illustrator who spends her days drawing, painting, and telling stories with pictures. This is her first book. Born and raised in England, she now lives in Minneapolis. 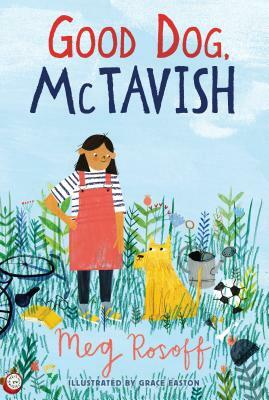 A perceptive dog rescues a family in crisis with sheer cleverness and humor...Easton's grayscale illustrations in her debut offer a gentle counterpoint, depicting the round-shouldered members of the Peachey family with light skin and straight, dark hair. This book is a good selection for those ready for the next step beyond early readers and will undoubtedly create more children wanting a great dog to join the family.